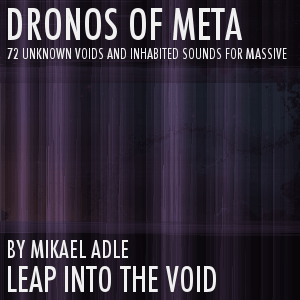 Dronos Of Meta contains 72 worlds of sounds, voids of the profound, and dark tempo-synced textures from the unknown, handcrafted with meticulous precision. All sounds are inhabited and alive and range from suggestive, ominous and dark to evolving, hypnotic and sometimes even lush. Dronos Of Meta makes extensive use of every feature inside the semi modular structure of Massive from comb modulations to organic worlds produced from precisely tuned feedback settings. The soundset is completed with a limited range of organs, bass sounds and leads that perfectly match the environment in Dronos Of Meta. Every sound comes with a detailed description in the comments area of the attributes which describes the sound, the macro assignments and also contains examples of variations were applicable. All sounds are designed with careful assignment of each macro knob with maximum focus on the specific preset and its intended use which enables extensive sound shaping possibilities should you want to. Either compose complete songs with just one sound or a combination of sounds or, use as textures and pads along with your preferred drum beat, bass and lead to add depth and an organic dimension. 72 inhabited worlds of sound stretched to infinity. Innovative assignments of all macro knobs. Suited for any kind of music and film production which needs dark atmospheres, multi-layered tempo-synced soundscapes, intense pressure, suggestive ambiences and evolving pads. Note: All sounds from the demo comes from the soundset with no external fx but a small amount of limiter on the output.